For all you like Rachel, who hate using coupons, I do have a few ideas for you! You can save money on your groceries without clipping coupons. You Can Save Money on Your Food, Even if You Hate to Clip Coupons! If you hate to clip coupons but still need to spend less on groceries, I have almost 30 different ideas to help you to chop away at that food bill – no scissors needed! The average family spends about $7,000 a year on food and groceries and the cost continues to rapidly rise. How does your food bill compare? Take a few minutes to tally it up and you should be extremely motivated to try some new money-saving strategies! 1. Get organized at home before you go grocery shopping. Allow time to make an inventory, a meal plan, and to think about the week ahead. The quicker you can get in and out of the store, the more money you will save. Don’t wait until you are in the grocery store to wander the aisles and figure out what you need. 2. Stockpile the non-perishable items that you will use for the next 3 months. When you see a great deal, consider buying 3 months worth of toothpaste, deodorant, pasta, etc. You can keep a running list of what you have in your stockpile on your master list. Note the price you paid on your master list so you can refer back to it. 3. Learn the layout of your grocery store. Often you can print a map from the store’s website. 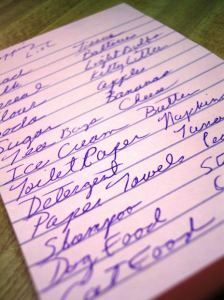 Make your master shopping list by aisles of your store for faster and more organized shopping. 4. Make a meal plan for the week based upon what is going to be on sale at your grocery store. If you only do this step, you will save money! Grab the store flyer when you first walk in (or check it online) and note the items on the front page. Those are the loss leaders and biggest markdowns for the week. Typically items are on a sales cycle of about every six weeks. Monday is a meal with Chicken, Tuesday is Pasta meal, Wednesday is Mexican food, Thursday is Vegetarian night , Friday is Pizza, Saturday is a meal with Beef, and Sunday is for leftovers. Adapt this for your family and then rinse and repeat each week. You will always have a plan for dinner! 6. Fast 5 – have a repertoire of 5 fast, easy and inexpensive meals that you can serve faster than ordering a pizza. These Fast 5 are for those extra busy nights so you won’t have to “drive- through” to get dinner. Keep them on a note card, or saved on your computer or smartphone. 7. Plan one or two nights each week where you cook once and eat twice. You can cook a chicken or a roast and make at least two meals out of it. Pasta dishes are excellent dollar stretchers. If you are washing and chopping something for a recipe, chop enough to use in one or two additional meals for the rest of the week. 8. Try going meatless one night a week. 9. Cook from your pantry and plan one or two meals a week with just the items you have on hand. The weekend is a good time to use what you have and not let anything go to waste. 10. Use a calendar or an online calendar to plan your meals around schedules. It doesn’t make sense to shop for elaborate meals when you will be getting home late from soccer practice, have a late meeting, or just need something on the table quickly. 11. Find more slow cooker recipes to put into your meal plans. Come home to a fully cooked meal. I have a great Pinterest Board full of slow cooker recipes that you can try. 13. Freeze extra food for a future meal. Use up the frozen meals within the next week. Add it to your meal plan calendar so it doesn’t get buried in the freezer and then tossed out. 14. Check the unit pricing. Sometimes the largest size is not the most economical. Buy in bulk when it makes sense for you. 15. Buy 10 and get the discounted price. Store policies vary, but often you can get the sales price on just one item. Carefully read the tag and ask if you are unsure. 16. Put your kids in charge! If your kids are old enough, pawn off the job of clipping and organizing coupons. Split the savings with them and call it their allowance. Think of all the lessons you can incorporate by including them in the meal planning, price comparing, and the money-stretching needed to run a household. 17. Use eCoupons – many grocery stores have electronic coupons that you can load right to your store loyalty card ahead of time. Swipe your card at checkout and those coupons come right off your bill. I also like SavingStar which has a large database of eCoupons. Your savings go into a fund that you can cash out in $5 increments. This is a great way to start a separate fund for Christmas shopping or for a special splurge. 19. Pick one drug store; CVS, RiteAid or Walgreens and follow their sales. Check the Sunday flyer to see their loss leaders for the week. You can save so much money on your toiletries, beauty products, paper products, OTC medicines, and more when you shop this way. You can get items for free and items that you can donate to your local shelter by shopping smarter at the drugstores. 20. Reconsider the warehouse store – if you shop at a big box wholesale club and feel like you are spending too much money, you must take the time to see if you can save more money buying some of these items elsewhere. Not everything purchased at these warehouse stores is a bargain. Sometimes we find ourselves consuming more because we have more, or throwing out perishable items because the quantity is too large. 21. Stay out of too many stores. If you are visiting several stores for just a one or two specialty items, visit once a month and buy what you need for the entire month. Limit the number of stores you frequent. 23. Try the dollar store in your area. The Dollar Stores are really competing with groceries stores these days. Check the frozen foods, produce, canned goods and more. You will see many brand names now where a few years ago it was mostly off- label goods. 24. The FREE Favado APP will tell you what is on sale at your local store. Register first for the Favado APP HERE (takes just a few seconds) , then go the APP Store or Google Play and download the Favado APP (be sure to register first) and you are ready to start saving more at the grocery store right now. 25. Try downloading the free Ibotta APP. You can get cash back redeeming and verifying the purchases you just made. Your cans can be transferred to PayPal, Venmo, or a gift card. 26. Download the newest free APP called Checkout 51. The savings I saw are for food and grocery items that I actually buy and for some hard to find coupon items such as fresh produce. You purchase the items, and then come home and submit your receipt to get cash back. Once you have $20 saved up, they send you a check. In my first week of trying Checkout 51, I saved an extra$6. 27. Start a produce and herb garden. Make this a family project and share your surplus. You will be amazed at how many ways you can serve zucchini! 28. Shop for local produce at Farmer’s Markets. The website Local Harvest will tell you what Farmer’s Markets are in your area. 29. Set a goal for saving a certain amount of money on your grocery bill and then plan a special family activity with the some of the savings. I recommend getting everyone involved in the process. Make a prop such as a graph, to continually track your progress to keep everyone motivated. #30 is your turn! Do you have a money-saving tip to save more money at the grocery store? I would love to hear from you. Do you have a friend who would like this post? Please send it to them or share this link from More With Less Today. Great ideas! I don’t like clipping coupons either. But these ideas sound very doable.